"Inspiration is about framing a design challenge and discovering new perspectives on the opportunity." "Try this: walk around your library and ask yourself why things are the way they are. Why is the circulation desk set up the way it is? Why is the reference collection where it is? Why are the recycling bins where they are? We bet that the answer to most of the questions you ask yourself will be, 'Because that's the way it's evolved.'" Look with fresh eyes. Pretend you are a patron walking into the library or visiting the website for the first time. How does the environment help or hinder you in getting where you want to go? Are you ready to make intentional design decisions in your library, instead of just doing things the way they've "always been done?" Great! Start by defining a goal (or if you prefer, a "design challenge.") This can be something as big as renovating your building or as small as improving a display of your upcoming events. 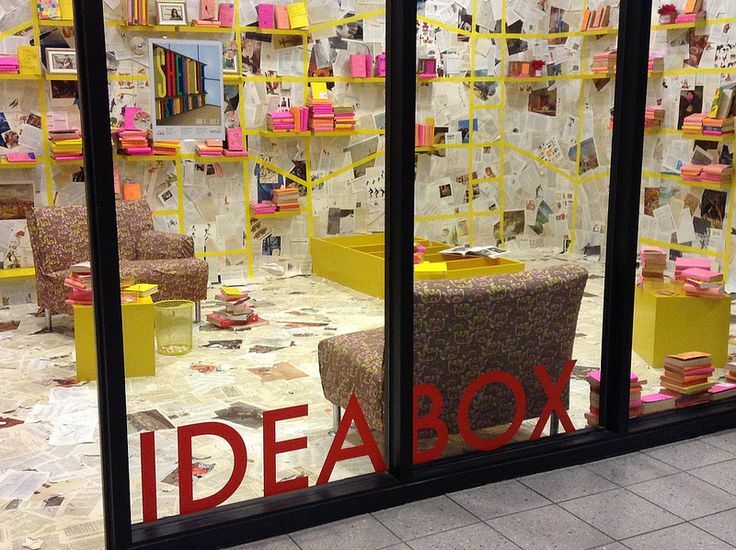 You have a great idea for a new service or space. Someone complains about noise levels or can't find something on the website. You read about something another library is doing -- or Starbucks, or Barnes & Noble. Become a sponge. Embrace new, even crazy, ideas for ways of serving your community. There's an emerging movement to reframe "library science" as "library design." Artists, writers, and other "creative types" carry sketchbooks around with them to capture sudden moments of inspiration. Why shouldn't librarians do the same? << Previous: How do I "do" user experience?